You all know that I live in Central Florida --And you have probably figured out that I have annual passes to Disney World. We usually make "day trips" to the park, but with mom in town, we decided it would be fun to spend the night. 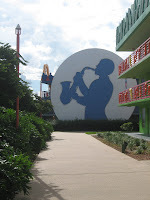 So, we made a one night reservation at Disney's All Star Music Resort. We were put into the "Jazz Inn 2". 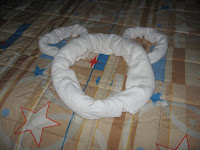 In the past, I have stayed over at the Caribbean Resort, All Star Sports, Boardwalk, and the Grand Floridian, so I thought I would take today's post to share my thoughts on lodging at Disney World. The All Star Resorts are the "value resorts" so are basically the "motel style" hotels on the property. The price is great (um, cheap! ), but you also have much more noise (due to more kids) on property (you may hear your neighbors through the walls or hear kids running the corridors at night) and only one dining choice (counter service). Also, the All Star Resorts are furtherest from MK and Epcot so you will have a longer bus ride to the parks. The Grand is my favorite but many can't afford to stay there. I would suggest the Grand for a honeymoon or anniversary trip, especially a trip without the kids. The location is AWESOME and the service is excellent--plus, the view to Magic Kingdom is great (you can see the firewords at night). But even better, in my mind, is the Boardwalk. I love that the Boardwalk has easy access (walking path or boats) to Epcot and Hollywood Studios, and I love the atmosphere at night. Also, there are great dining options...and let me add, the Boardwalk as a killer swimming pool area! Of course, let's get real, most families are on a budget, so I suggest the moderate resorts like Caribbean or Port Orleans. These hotels are a little closer to the parks yet and offer more dining options than the value resorts. So there you have it, my two-cents! 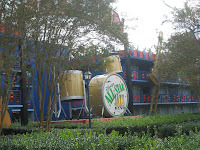 BTW, for great pictures and hints about where to stay at Disney, visit http://www.allearsnet.com/!